SteamPunk Glass: Whats in a name? 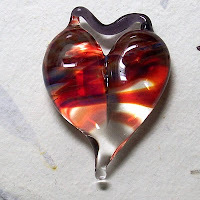 One of the first things I tried making in glass where heart beads. However my first efforts were rather ‘unfortunate’ so I was delighted to come across a new way of forming them freehand a little while ago. What I particularly like is the little hanger which adds an almost Victorian flourish to them, plus (when I get them right) the space between makes another heart shape! I still can’t get them quite even, but I’m probably being fussy! In fact I’ve just made one deliberately uneven, which I like it more than the even ones as I think it has more character! 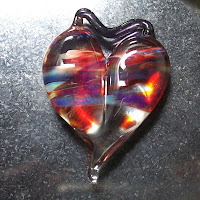 Borosilicate colours can be really odd; because of the weird way they react with light they look different depending on the light source, the direction of the light, what’s behind the glass and so on. I’ve had to start taking photos with them on both white and black backgrounds to give a true impression of how these look. Under daylight the purple lustres come out (I guess it’s something to do with UV) but put them in front of a white card and they vanish again! One of the colours I’ve been using to get really rich purple lustres is called ‘Silver Creek,’ which I had to order in direct from USA as no one stocks it over here. Before that I was using double purple and triple purple passion and still not getting the zing I wanted. I think it’s called ‘Silver Creek’ because it’s got a lot of silver in the formulation, but doesn’t really help tell you what colour it will be! Boro colour makers have gone wild with their naming, I guess because all the ‘normal’ glass has got all the sensible names already! I’ve got rods with names like ‘Alien Blood’ (green-white) ‘Unobtainium’ (an amazing pearlised blue) ‘Steel Wool’ (glittery grey) even ‘Red Elvis’ a transparent red which sounds like it should be a Cold War Communist version of the King of Rock & Roll! These odd names are rather handy as it helps me to remember what the colours do as unlike normal soft glass they don’t look the same as when they are melted in. Many of the rods are so dark they look dark blue or even black, but when used do strange things instead, even turning cream coloured! The older colours tried to have helpful names, but Green Amber Purple isn’t a great name – and this glass starts out Bristol Blue coloured plus I’ve not yet got any purple out of it either, although wonderful creams, yellows, ambers, blues and greens!. I try to label every boro rod, but I do end up scrabbling around for a certain colour with one hand while holding a hot marble in the other, so there can an element of serendipity as I end up using another colour instead. At least these colours live up to, and often exceed, their wonderful mad names. Many years ago I was helping stack paints, all had been given glamorous emotive names like ‘harvest barley’ (a sort of yellow off-white) and ‘seagulls wing’ which turned out to be a very boring grey! Hello to a more interesting year!